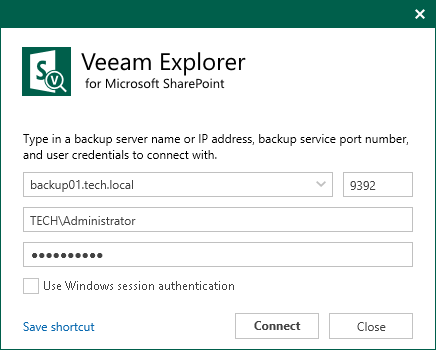 You can use the Explore option to explore backups created by Veeam Backup for Microsoft Office 365. For more information, see the Data Restore section of the Veeam Backup for Microsoft Office 365 user guide. You can go to Start and click Veeam Explorer for Microsoft OneDrive for Business to launch the application as a standalone console. Then, add Microsoft OneDrive databases manually, as described in the Standalone Databases Management section. Specify the name or IP-address of a Veeam Backup for Microsoft Office 365 server to which you want to connect. Specify user credentials to connect to the server. The account must be a member of the Local Administrator group on a target server. To use your current account, select Use Windows session authentication. To save the connection shortcut to your desktop, click Save shortcut in the bottom-left corner.